Socks are portable, fun to knit, and quick to completeand they make great gifts. This step-by-step guide walks you through all the techniques used to knit beautiful socksfrom buying yarn to working on double-pointed needles, from turning a heel to grafting a toe. 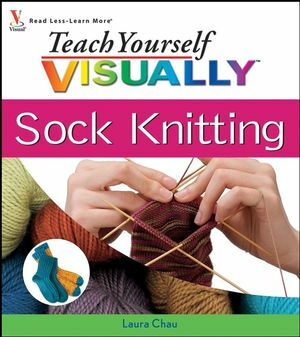 It covers knitting socks top-down, toe-up, and flat, explains how to create various heels and toes, and gives you a dozen original patterns for everything from baby booties to knee socks. Whether you're new to knitting or just new to socks, you'll learn the skills needed for a lifetime of creative sock knitting. Laura Chau is a self-taught knitter, designer, spinner, and dyer. She works as a custom dyer and teaches numerous classes at Toronto's popular yarn store Lettuce Knit. Laura has had multiple designs featured on Knitty.com and sells her patterns on her Web site and blog, cosmicpluto knits! (www.cosmicpluto.com). Sock Yarn and Other Materials. Sizing Chart and Yarn Requirements.